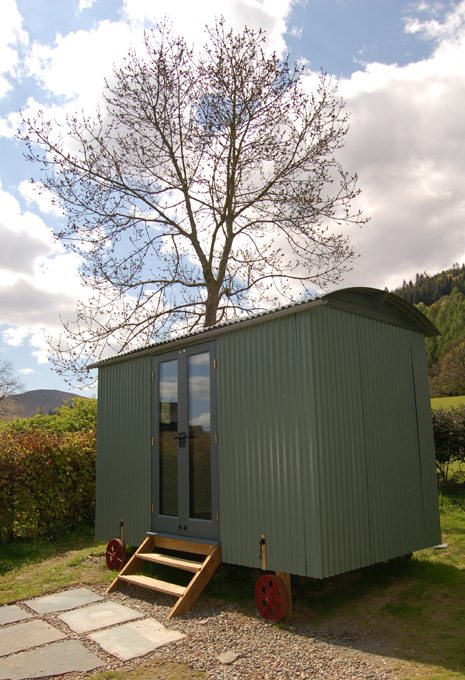 The Shepherds’ Hut comfortably sleeps two people and is situated in it’s own area of the campsite, with views towards Skiddaw through the French doors to the front, and Barrow through the window on the side. A stream runs along one side of The Shepherds’ Hut. There is a slate bench behind The Shepherds’ Hut, and in front a campfire already set up. An alternative to camping. Just bring everything you would normally bring camping – but leave the tent behind! 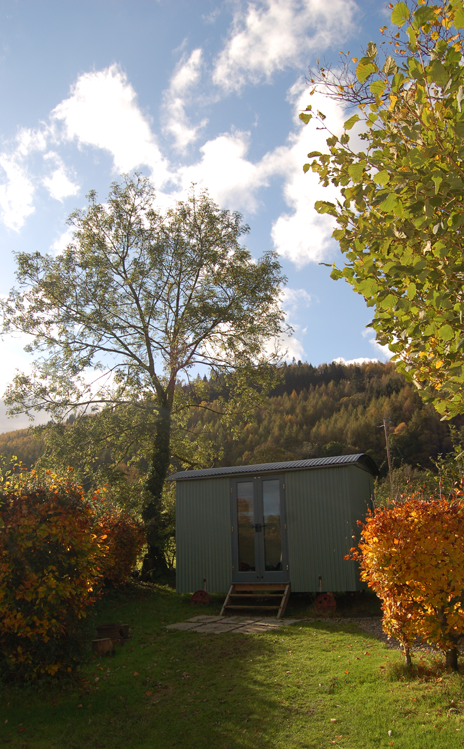 Fully insulated, and has painted wooden panelling inside, with a wooden floor. A built-in bed, with a mattress made especially to fit! Two shelves, and hooks for hanging clothes, etc. Outside there are wooden steps to the ground, and a small paved area, surrounded by grass and native hedging. 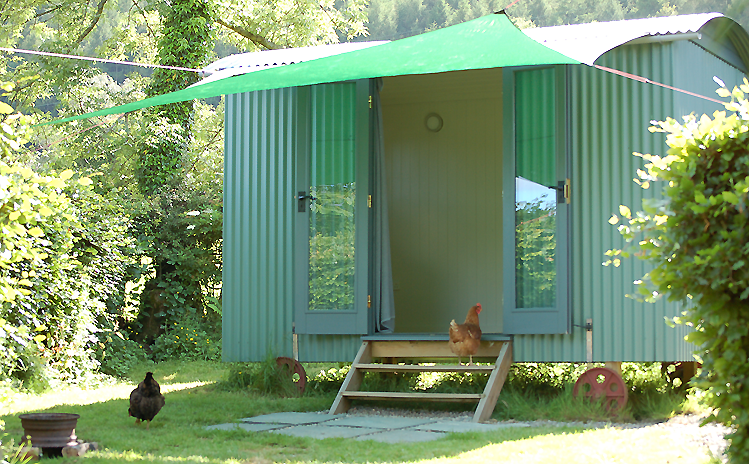 A canopy which fits onto the front of the Shepherds’ Hut, provides a sun shade in the better weather, and welcome shelter from the rain on wet days! Dogs: are welcome to stay in The Shepherds’ Hut, but we do ask that they are not left inside on their own, and they must be kept on a lead whilst on site. Fires: Cooking and naked flames are not permitted inside The Shepherds’ Hut. A campfire area is set up in front of The Shepherd’s Hut. 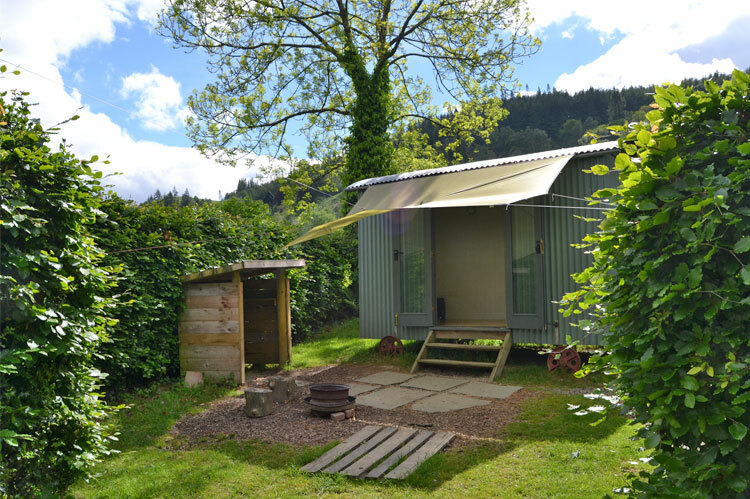 Arrival: The Shepherds’ Hut will be ready from 2pm for arrivals. 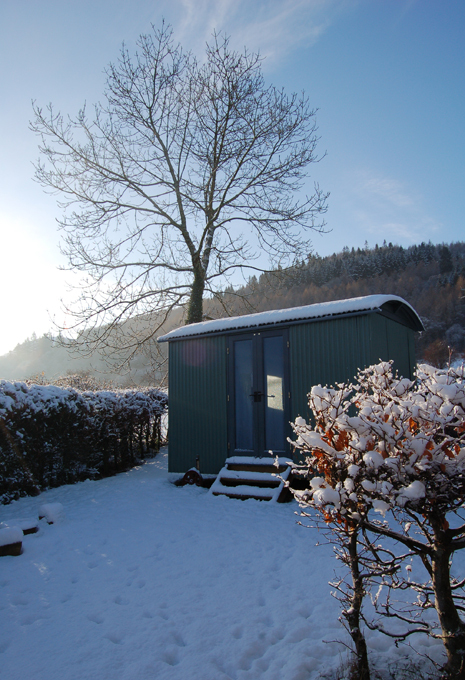 Please do not arrive early, as The Shepherds’ Hut may not be ready for you. Departures: Must be vacated by 11am on the day of departure.